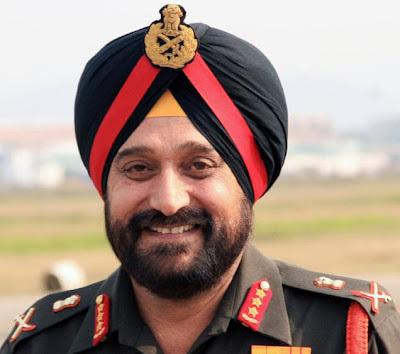 Chindits: Bikram Singh Is 25th Indian Army Chief, Kali-chindi Paltan In Full Attendance To Bid Farewell To V K Singh!! Bikram Singh Is 25th Indian Army Chief, Kali-chindi Paltan In Full Attendance To Bid Farewell To V K Singh!! I was there today morning outside South Block's gate no. 2, braving the scorching heat and sun, and also not to forget the auto-cab strike due to Bharat Bandh, all of which made the day memorable for me. I had a sense of deja vu, as I was there when Gen V K Singh took over on April 1, 2010, from Gen Deepak Kapoor. pril 1, 2010 was also a thursday and that day too was auto strike, today when Gen V K Singh demitted office, it was again a thursday and auto/cab-strike!! Kalichindi was in full attendance. There were lots of promises made on April 1, 2010, which Gen V K today said that they have been fulfilled or are on the way of being fulfilled. Transparency, hollowness, changing mindsets of the army, etc, were spoken by V K Singh today as well. No word so far officially from Bikram Singh, but tough road ahead. V K dodged questions directly concerning Bikram. Well body language reminded me of April 1, 2010, quite the same between VK-Bikram as was between Deepak-VK!! Discomfort, uneasiness. V K Singh took all the questions, as now he's quite an expert on interviews, all mugged-up answers were given.